Let's take a look at this month's Boxycharm box! Boxycharm is a monthly beauty subscription service that features makeup, skincare, hair and nail products. Each box typically contains 5 full size beauty items. 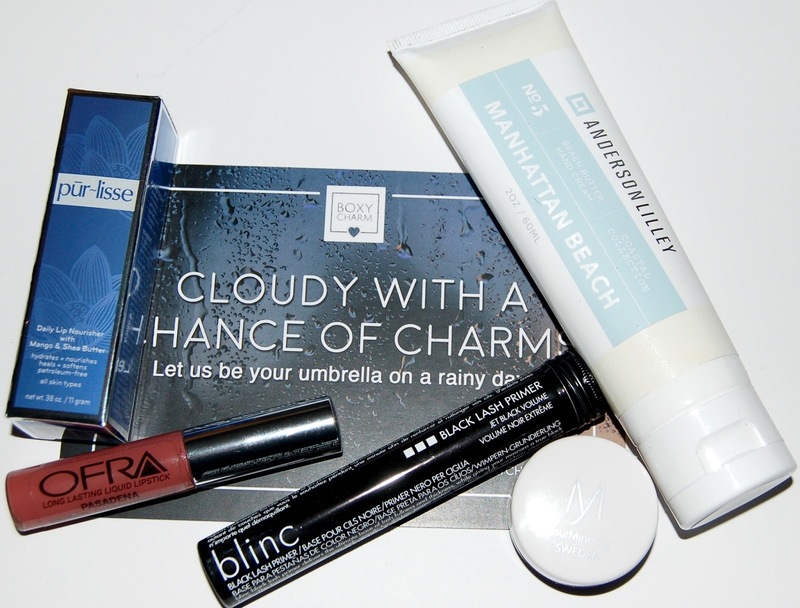 The theme for this month's box is Cloudy With A Chance Of Charms. This lip balm is enriched with mango and shea butters, jojoba and rice bran oils, and Vitamin E to hydrate and seal in moisture. I really like this balm, it feels really nice on my lips. It has a more liquid-like consistency than most thicker balms. This is a black lash primer that is supposed to separate and lengthen lashes before you apply mascara to give a jet black voluminous look to your lashes. I look forward to trying this since I've only used white lash primers. This is a nice light hand cream with a clean scent. This would be nice to use all over the body as well. This is a mineral eyeshadow. Since I don't really use loose eyeshadows I'll be passing this product along. I love Ofra's liquid lipstick and was excited that I was getting another one in a Boxycharm box! Sadly though, I already have this shade but I still appreciate that it was included in our box. If you'd like to see a swatch you can check out my full review of Pasadena and a few other Ofra Liquid Lipstick shades here. It's my favorite shade that I own. Overall, the April Boxycharm box didn't really excite me but that might be my own fault because I already own the 1 of the 2 makeup products that was included. 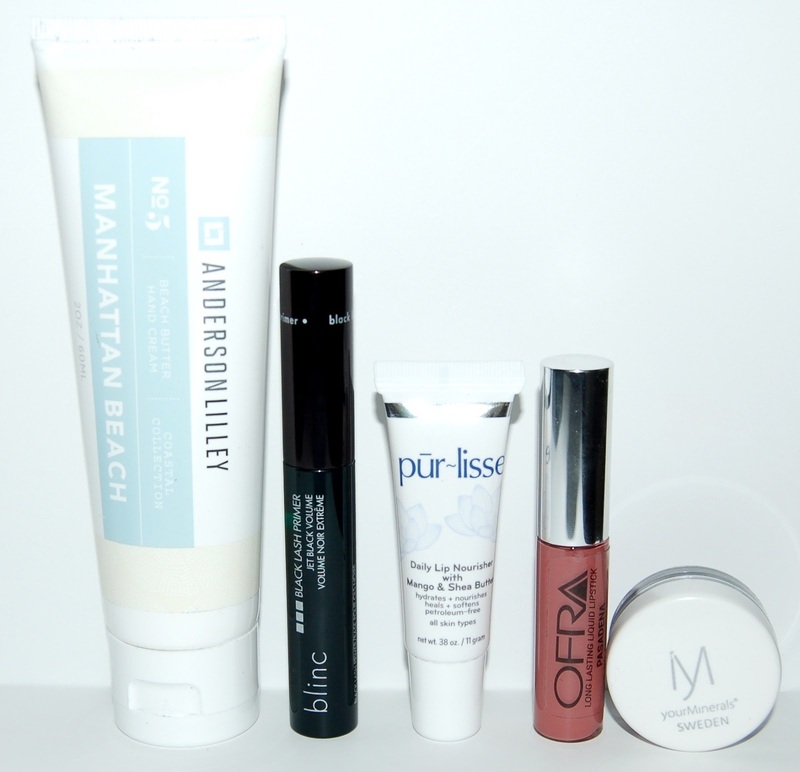 I do look forward to using the lip balm and trying the lash primer. Each Boxycharm Box costs $21, shipping is free, and you can cancel your subscription at any time. As you can see, I received 5 full size items in this month's box. The retail value of this box is about $107, that's 5 times the cost of the box! If you'd like to sign up for Boxycharm you can do so HERE. *I received this product for review. All statements are 100% honest and my own.